Lyn Wells’ culinary career began at a young age, working at her family’s fine dining restaurant. This naturally led her to pursue a degree in culinary arts from Utah Valley University (UVU). 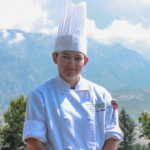 Lyn’s experiences at UVU allowed her to participate in over 20 sanctioned culinary competitions nationwide, earning scores of medals and awards, including ACF Western Region Student Chef of the year in 2013. She has gone on to apprentice for ACF National Chef of the year finalists twice, and was an apprentice for the 2012 ACF National Pastry Chef of the Year. Lyn achieved all this while completing her AAS & BS degrees in Culinary Arts and Hospitality Management at UVU. It was my mother who inspired me to became a chef, and being able to work alongside my family over the years has meant a lot to me. I enjoy the rush, the drive, and seeing it all come together through collective work. This is something I was able to experience at a young age. Not only did my family own a restaurant but we also had a farm. We raised sheep and cows, and grew our own potatoes, which we used at the restaurant. Being able to see the process and taste the difference in the food really inspired me. How did your education at Utah Valley University prepare you for the restaurant world? UVU is an engaged learning university, meaning that it is hands-on and career-based. In each of my cooking lab classes, it was about repetition. We learned the basics in the basic-level classes and then started building on the foundation as the curriculum progressed - from butchering and preparing chickens, to making cakes 100 times. It was important that all of the chef instructors had worked in the industry. They understand the restaurant world and what it takes to be successful. What part do you think mentoring played in your win at the 2014 Young Chef Competition in Los Angeles, and in your participation in other competitions? Mentoring plays a huge role in my life and career. I am fortunate enough to have a mentor and an organization that supports competing. For the 2014 Young Chef Competition I came up with my dish, and then my mentor, Peter Sproul CEC, and I improved on the flavors and techniques. I have continued to compete after the 2014 Young Chef Competition and recently won the 2016 Best Jeunes Chef. None of this would have been possible without the help of Chef Peter. He pushes me every day to improve and grow. How have you grown as a chef since the competition? I have grown as a chef in many ways since the competition. My stage at The French Laundry (TFL) taught me so much about organization, cleanliness, and teamwork. These are traits that I continue to use every day. When working in a kitchen every second counts. It is important to be organized, neat, and set the station up for success. Now, each time I work on a project or a competition, I have a sense of urgency. What are the greatest lessons you have learned from the chefs around you and specifically those who you consider to be your mentors? Some of the most important lessons I have learned from chefs are to push yourself, to keep learning, and to love what you do. It is important to always set goals for yourself. If there is no standard set, then it is hard to improve. For example, when working on a project, us a timer to see how long it takes; then the next time try to work faster and beat the previous time. Why do you think mentoring is so important for young chefs? Mentoring young chefs is important because it allows them to learn and be able to work under someone who they admire. It also gives them an opportunity to build a foundation. From personal experience having a mentor has helped me learn a great deal, and gain confidence in myself.